Even after watching Tyler Rhodes award-winning evolution animated video featuring the drawings and voices of local school children from William Fox Elementary and Patrick Henry School or Arts & Science, I still couldn’t really wrap my mind around exactly WHAT Tyler Rhodes was doing in the Conservatory each Saturday. Something about crayons, flowers, bees, kids, drawing and evolution. So….. I came for a visit myself to see and document the process of orchid evolution — Crayola style. As participants Tyler Rhodes had us work through several stages of drawing before he told us that there actually is a flower called a bee orchid — and it really does look like a bee in order to attract bees! 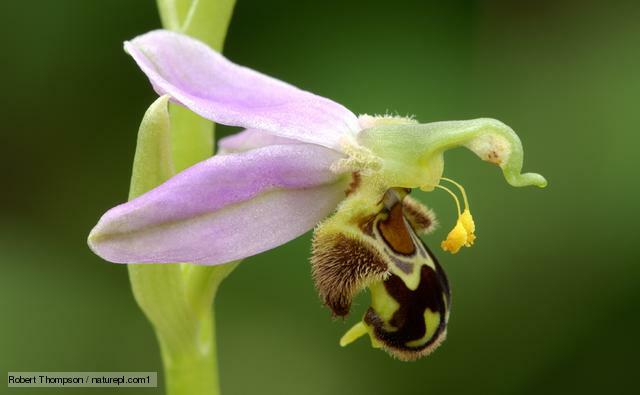 Ophrys apifera even sends out enticing chemical signals to lure a real bee to come and mate. Now that is an amazing adaptation! I knew I was in for a memorable experience when Tyler told me he could really related to the archetypal mad scientist. Put on your mad scientist voice then say, “…..drawings….. more drawings….. ahhhh ha ha!” and you get the idea. But seriously, Tyler has the kind of passion for this project that you find in really driven artists and scientists who are doing really important work. He’s driven, and really enjoys his work. The “bee tree” made from our bee orchid drawings. How do you make an authentic evolution animation? Quite simply: you allow it to evolve. Tyler Rhodes, a student in the animation program at Virginia Commonwealth University, wanted to create an animation that wasn’t simply linear, but instead represented the true ‘tree-like’ process of evolution. If you still don’t understand, come experience it for yourself this Saturday at 11 a.m. in the Conservatory!